Want to give a friend, a child, or a family member a little money, but not sure how to present it? 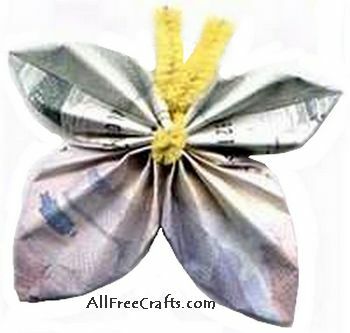 Here’s how to make paper butterflies from dollar bills or other paper money; a little homemade gift that is sure to delight anyone! Refer to the step-by-step photos, and the picture of the finished dollar bill butterfly above, to help you assemble this craft. 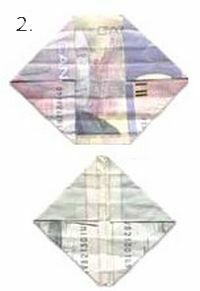 Begin by folding one bill to the centre at each end. 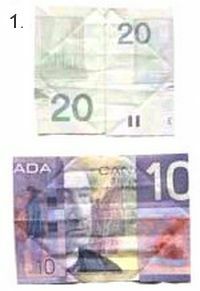 The other bill is folded from the end inward, leaving the same amount of space in the centre of the bill as are the folds on each end. The butterfly wings are not the same size at the top and bottom, so different folds are required to make the lower wings a little larger. 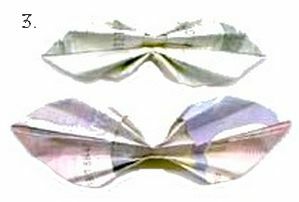 Now that you have your first folds – refer again to the diagram, then fold the four corners of each bill into the centre and once again leaving a larger opening in the centre for the larger wing section. Once you have all the folds complete as shown in the diagrams, you need to fan fold your bills. Fan fold each bill and the attach them together with a chenille stem. Leave the ends of the chenille stem extending out and pull the fan folds out slightly to create the wings.